A prototype remade as a limited edition. To mark the 50thanniversary of the Sub series last year, Doxa launched a faithful reissue of one of its most coveted watches – the Sub 300 Professional prototype dubbed “Black Lung” by collectors, a reference to its yellow-on-black Aqua-Lung logo. The emblem never made it to final production as it compromised legibility whenever the black hands swept past. Doxa instead replaced the “Black Lung” with a line drawing of the logo. While arguably the best known variant, the Sub 300 Professional with an orange dial wasn’t the only one bearing a blacked-out Aqua Lung logo as a prototype. 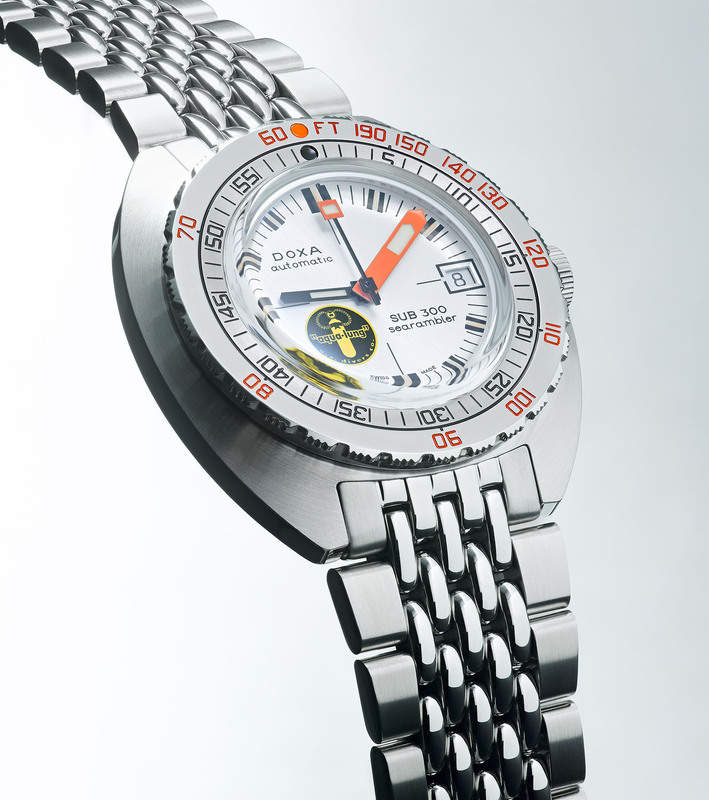 All three versions of Doxa’s dive watches did, including the Sharkhunter, which had a black dial, and the Searambler. But while a handful of Sub “Black Lung” watches made their way into the market, the other two prototype variants never did. 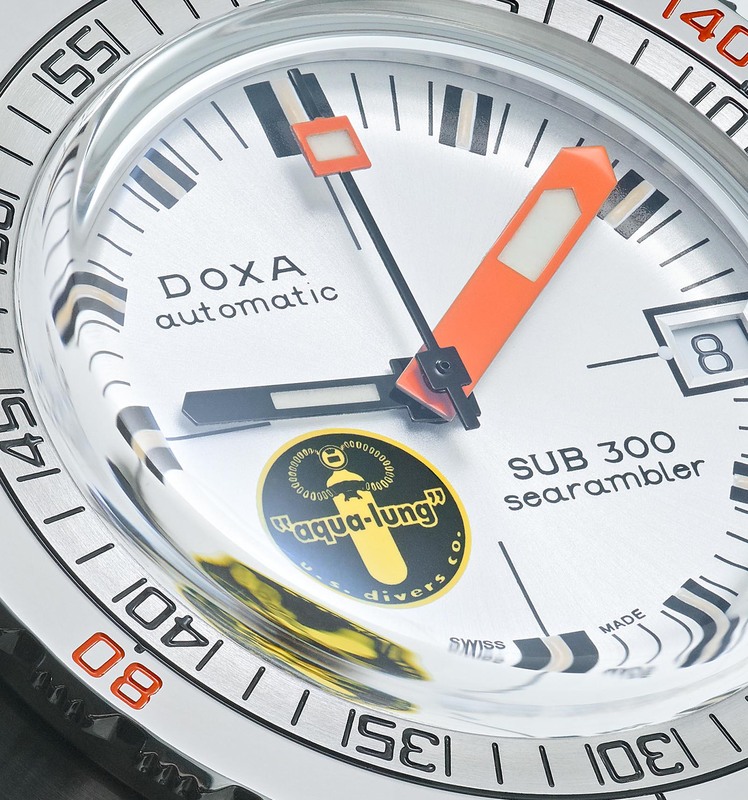 Now Doxa has remedied that with the Sub 300 Searambler limited edition bearing the classic yellow-on-black logo to mark the 75thanniversary of Aqua-Lung scuba apparatus, hence the “Silver Lung” nickname. It’s the first time the prototype Searambler has been commercially available, albeit as a serially produced limited edition. The new Searambler sticks to the same successful formula, retaining the attributes that has made the original Sub 300 a success when it was launched in 1967, and something of a cult dive watch today. From the quirky typography to its square-tipped second hand, all the elements have been exactly reproduced. Finished in a silvered, brushed sunray pattern, the Searambler dial is arguably less polarising than those found on its brightly coloured cousins. 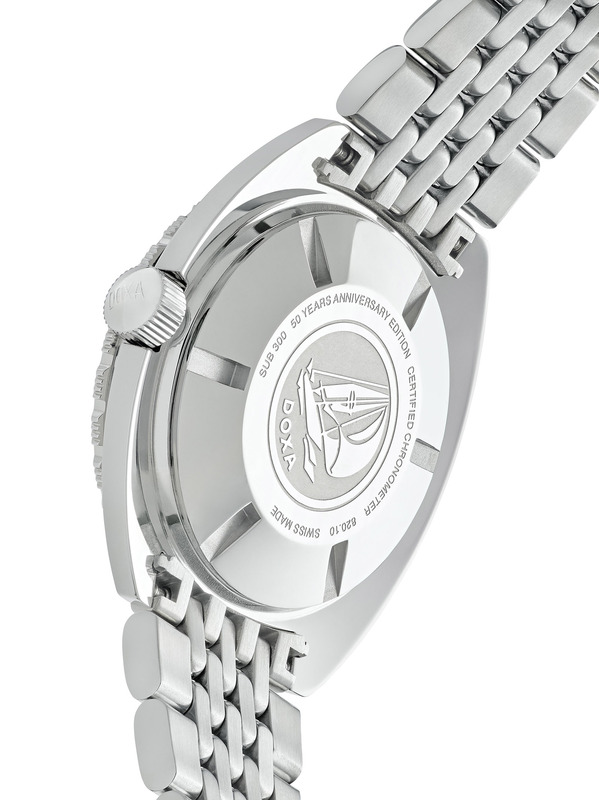 The dial, smallish relative to the case, is topped by a domed sapphire crystal to mimic the look of acrylic. And while the dial isn’t in Doxa’s iconic orange, the watch does have a practical edge over the “Black Lung” – the wide minute hand is in orange. A standard feature on the Searambler, the contrast colour minute hand eliminates the possibility of confusing the two hands, or mixing them up with the black Aqua-Lung logo. It has the signature tonneau-shaped steel case topped with a serrated, rotating bezel engraved with Doxa’s patented “no deco” outer scale that displays the decompression stops according to the US Navy’s dive table (which is today outdated and no longer in use). And it’s finished with a retro beads-of-rice bracelet that tapers to an integrated wetsuit extension inside the clasp. The case measures 42.5 mm in diameter by 13.4 mm thick. And inside is the self-winding, chronometer-grade ETA 2824-2 movement with a date function. The Sub 300 Searambler “Silver Lung” is limited to 300 pieces, and available for pre-order direct from Doxa at US$2190, instead of the retail price of US$2590. It is slated to ship in August. 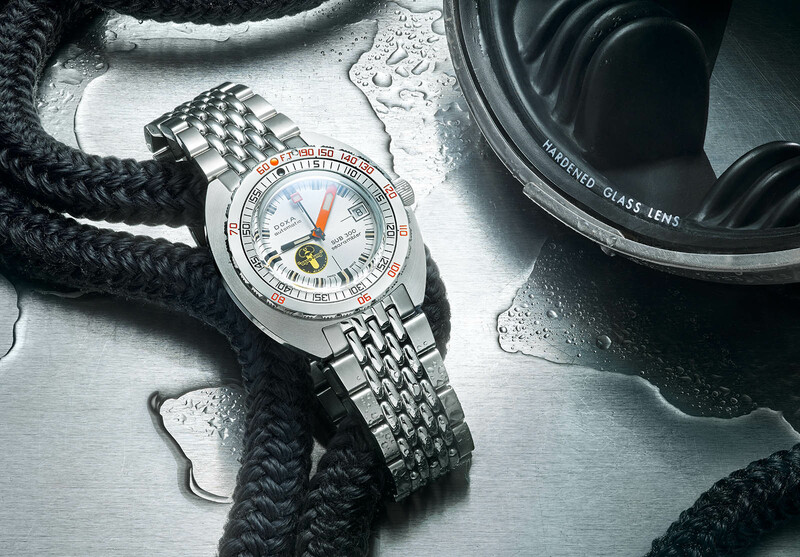 Recreating one of the most sought-after Doxa watches. Since the first Casio G-Shock rolled off the production line in 1983, the shock-proof watch has grown into a monster hit, selling over 100m units by 2017. At times cartoonishly bulky, the rugged style of the G-Shock is perhaps watchmaking’s most extreme example of form following function. But what comes as the biggest surprise is its adaptiveness. Despite spawning over 2000 variations to date, the G-Shock remains distinctive, unique enough that it’s become the benchmark for robust, oversized electronic watches. And yet it’s versatile enough for almost anyone, being worn by military special forces, astronauts, sportsmen and pop stars. Having conquered the mass market, its move upmarket with the all-metal MR-G was inevitable in hindsight. 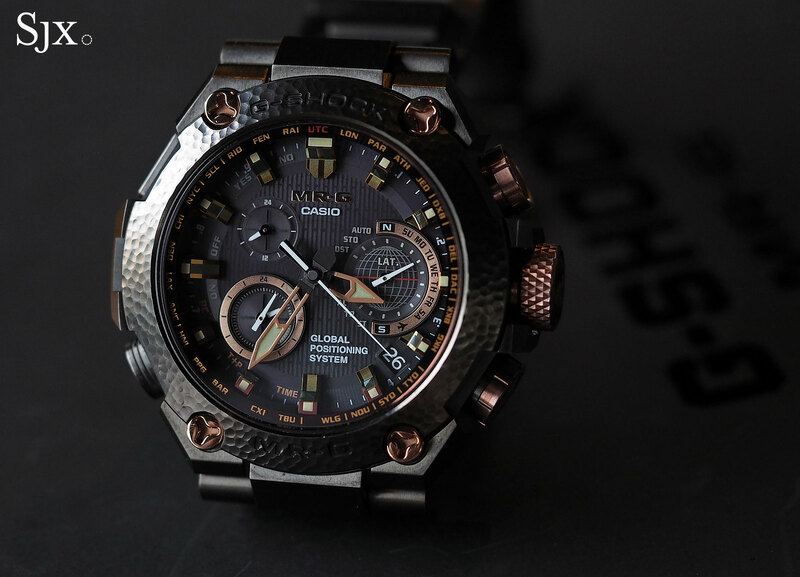 Conceived to combine bleeding edge technology and traditional Japanese decorative techniques, the MR-G was Casio’s first foray into luxury sports watches, launched over 20 years ago in Japan, but only sold internationally starting 2015. In his mind, the transition from digital to analog displays seemed like a natural step in the move upmarket, which is why the MR-G now typically features traditional hands in addition to a digital panel. 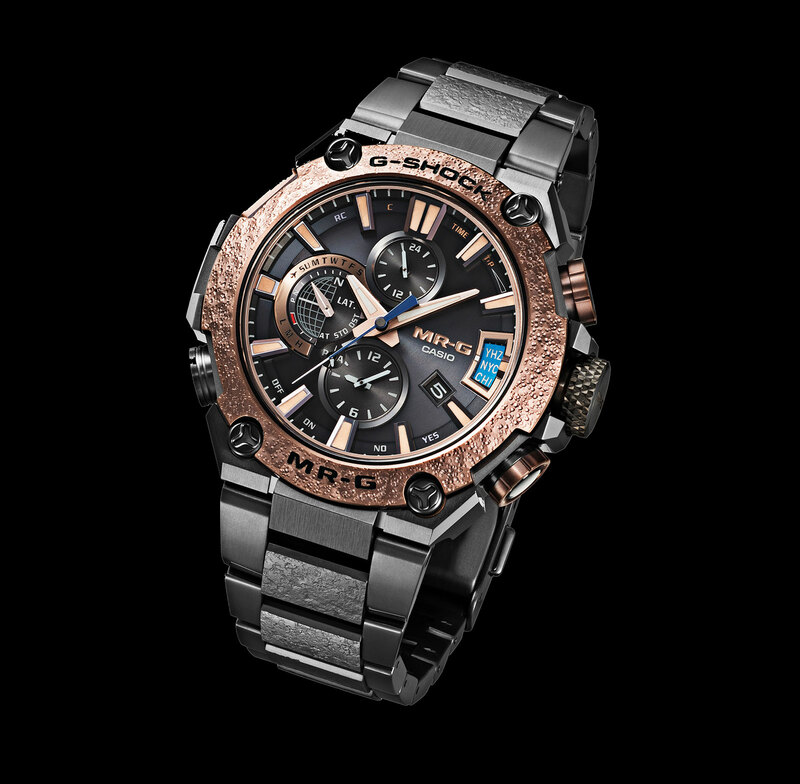 Though the aesthetics are different, the MR-G remains rigorously dedicated to the philosophy of the G-Shock. Regardless of the new white-collar incarnations, a G-Shock can never lose its blue-collar robustness, according to Mr. Ishizaka. It was, after all, a watch designed for construction workers. “It has to be unbreakable and shock-resistant, and that informs its design. Not only that, it also takes the form of all of its hi-tech functions,” he stressed. Like its plastic predecessor, an MR-G uses multiple parts for the case – the bezel and back are separate from the case middle for instance – with shock absorbers between them to protect the electronic module from shock. 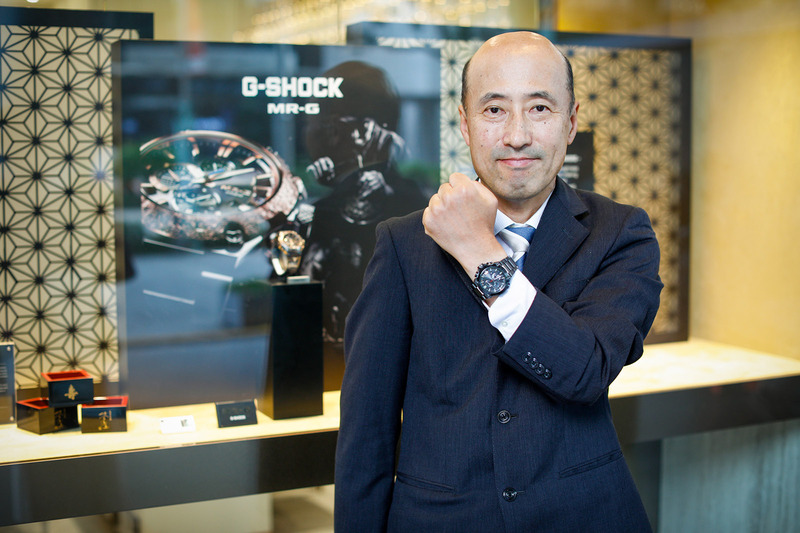 “However, in contrast to a regular G-Shock, we use the most advanced technology and rare materials in a MR-G, with many components that are crafted by hand,” added Mr. Ishizaka. 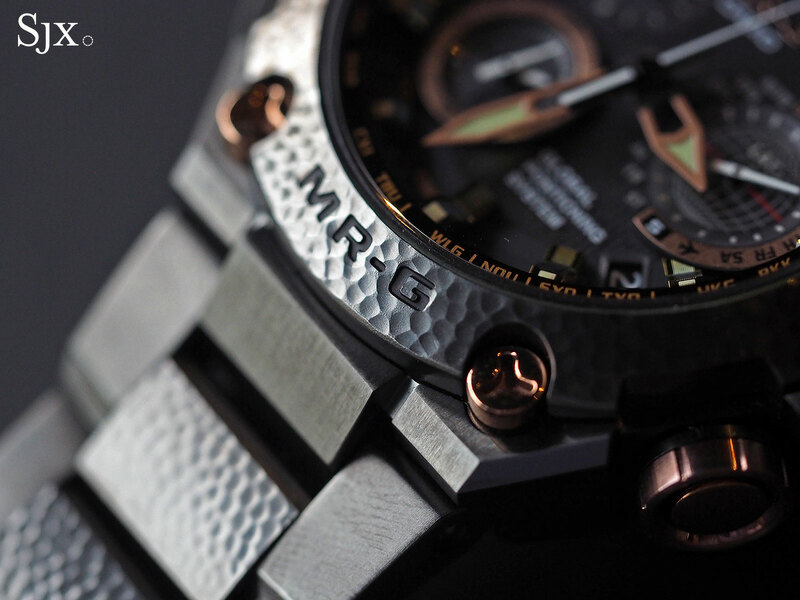 Since the beginning, all MR-G watches have cases and bracelets in steel or titanium, with more recent models boasting elaborate surface finishing, like the recently launched MR-G “Hammer Tone”. The case decoration, plus the electronic functions and spatial demands of fortifying a metal watch, result in an aesthetic that is far more complex than the average sports watch. Consequently the MR-G resists all attempts at categorisation, but when viewed through the perspective of Mr. Ishizaka, this seemingly awkward combination of the most advanced technology and the most traditional of Japanese decorative techniques seem apt. “Premium G-Shocks are made in our Yamagata factory in Japan so I wanted the watches to look the part. I wanted them to look like they were obviously made in Japan,” explained Mr. Ishizaka. “I thought about the traits of Japan that were easily identifiable. It is widely known that Japan is a country where ancient traditions coexist with modern technology so eventually I arrived at this combination.” Think of it as samurai meets sci-fi. The top of the line G-Shock is now available with a gilded, hand-hammered finish.